Physical software sales are forecast to rise 11% worldwide, even as more of the industry shifts to digital. Red Dead Redemption 2 is one of a handful of titles that have led to DFC Intelligence recently raising its forecasts for both 2018 and 2019. The hotly anticipated Rockstar title has been eight years in the making and, "assuming the game lives up to its reputation this should be the biggest title of 2018," DFC noted in its latest report. The original Red Dead had sold-in (shipped) over 14 million units, and some believe the sequel will top that. DFC noted that there are some other major console games to power the back half of 2018 that will vie for consumer dollars, including EA's Battlefield V, Activision's Call of Duty: Black Ops 4, Ubisoft's Assassin's Creed Odyssey, Bethesda's Fallout 76, Square Enix's Shadow of the Tomb Raider and new iterations of EA Sports franchises like FIFA, Madden, and NBA. But RDR2 is positioned to outpace them all, even without a games-as-a-service mentality. “Our interest is not games-as-a-service or single-player or multiplayer or episodic. 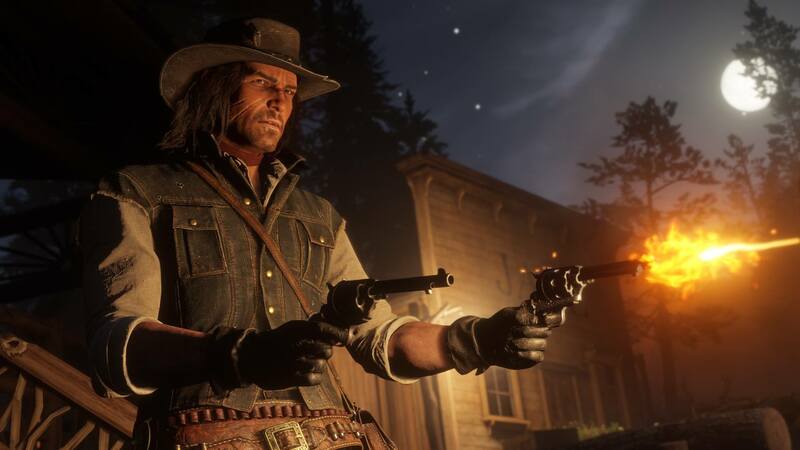 Our interest is in captivating and engaging consumers with the best entertainment anyone makes, of any sort, and if we do that and then we give consumers even more great stuff to engage with it should work out well, and naturally the revenues and the profits will follow,” Take-Two CEO Strauss Zelnick explained to GameDaily at E3 2018. In terms of console-selling exclusives (something we see less of in today's marketplace), DFC pointed to the well-received Spider-Man from Insomniac Games as the real standout. The Game Critics Award-winning game for the PlayStation 4 could give Sony's platform a nice bump heading into the holidays. "Arguably, the biggest exclusive is Spider-Man for the PlayStation 4. Sony has a nice bundle with a limited edition red PlayStation 4 Pro featuring the Spider-Man logo and bundled with the game for $399. This is a great promotion for the PlayStation 4 Pro. Sales for this system have been underwhelming but in the recent DFC survey of console gamers, the PS4 Pro is seen as one of the most attractive systems. Spider-Man could get many consumers to bite," DFC wrote. On the Xbox side, the next Forza Horizon, featuring some impressive dynamic weather effects, could possibly be enough to move the needle for Microsoft's platform, DFC believes. "In the U.S. sales for the Xbox One have been pretty decent so far this year. The system could actually meet our forecasts, something it has failed to do the past few years. The only major Xbox One exclusive is Forza Horizon 4. However, the Forza Horizon series is alone almost a good reason to own an Xbox One," DFC stated. If some players aren't into the racing scene, at E3 2018 Xbox made sure to bolster its first-party studio system with the addition of five new studios, so the portfolio of exclusives is likely to have a wider slate in the future. Looking at the Switch, the obvious selling point this holiday will be the new Super Smash Bros. Ultimate, which Nintendo dedicated the vast majority of its E3 Nintendo Direct to. "More than any other title, this should be one that drives hardware sales for the Switch. The only other major Switch exclusives are the Pokemon: Let’s Go games," DFC remarked, while also noting the positive reception to Square Enix's RPG Octopath Traveler. "This provided some much needed diversity for the platform which so far has targeted a younger game audience," the firm said. All told, DFC is expecting 2018 packaged software sales to finish strong, up 11% worldwide even as digital soars. The firm is forecasting a 32% rise in digital sales globally. PC game sales, too, are expected to increase a more modest 6% this year. It's worth noting that all this growth is taking place even as a number of publishers have moved top titles out of the fourth quarter and into Q1 2019, which is turning into a highly competitive period of its own with games like BioWare's Anthem, Square Enix's Kingdom Hearts III, Sony's Days Gone, 4A's Metro Exodus, Ubisoft's The Division 2, Microsoft's Crackdown 3, and Capcom's Resident Evil 2 Remake all scheduled for release.